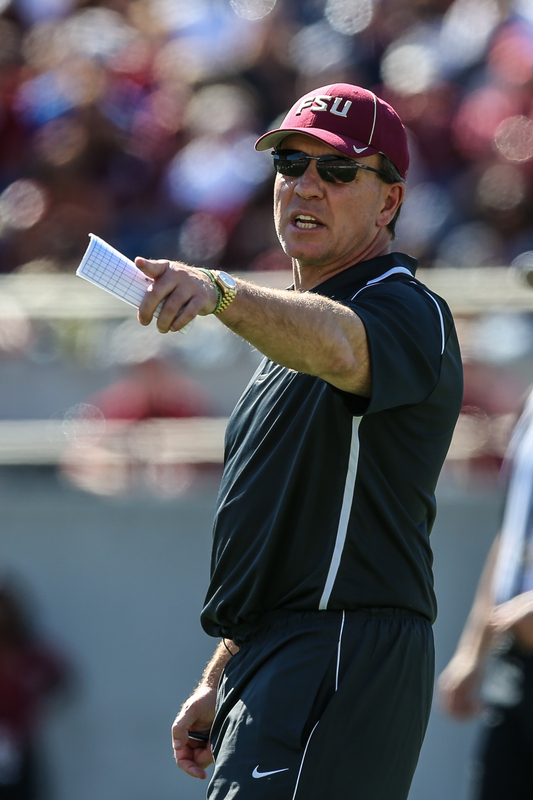 According to reports, Jimbo Fisher is going to be staying at FSU for a while. The only unanswered question, of course, is why he would ever leave. This has been the mystery part of the equation all along. LSU is a fine job, of course, but so is FSU. You can bring a lot of top recruits to LSU. Also, to FSU. There is no excuse for LSU not to be among the nation's top 25 teams most seasons. Or for FSU. And so it goes. For every advantage LSU has, FSU has the same. And so, at this point in his career, why should Fisher have ever changed? Because he has some old polo shirts in LSU's colors? Because he likes cajun shrimp? This is always the funny part of a coaching hire. Everyone immediately connects the job with the dream candidate and tosses the headlines out there. But the truth is this: The nation's top 25 coaching jobs usually don't hire their coaches away from the top 25 poll. Think about it: Alabama hired Nick Saban because he was unhappy in the NFL. Ohio State hired Urban Meyer away from ESPN. Michigan hired Jim Harbaugh who had been canned by the 49ers. Clemson hired Dabo Sweeney from its own staff. Florida promoted Jim McElwain from a smaller school. FSU hired Fisher from on staff. Louisville hired Bobby Petrino from the garbage pile. And so on. So ask yourself this: Why in the world would Fisher have ever left for LSU? What do the Tigers have the Seminoles don't? What can he win in Baton Rouge he couldn't win in Tallahassee? Okay, okay. So Fisher wanted a fortune, supposedly $6.5 million a year on a 10-year contract. That was enough to make even LSU blink. I'm still not sure Fisher would have said yes to a lateral move, but it was at least enough of an offer to make a coach listen closely. Oh, I understand why Fisher wouldn't slam the door. The first rule of being a head coach is that you never say no to anyone. That's agent advice. Maybe you can get more money out of a job offer. Maybe you can get better assistants. Maybe you can feather your next one way or another. But in the end, you stay put. Fisher has a young, talented team. He has a solid recruiting class. He has things together in the ACC, which is a good league, although it isn't quite the challenge the SEC West is. In the West, of course, you have to play Nick Saban once a year. Overnight, however, all of the unnamed sources went from saying how much LSU loved Fisher to how much it loved Houston coach Tom Herman. That makes sense. LSU would be a promotion for Herman, who would have much greater possibilities on the bayou than in Houston. Oh, someday, FSU will lose Fisher. Some NFL team will offer a new challenge, and he'll have to choose between being a Tallahassee lifer or being an NFL climber. I wouldn't be shocked if Fisher went to the pros. Now, Fisher has a chance to finish out a good, but not great, season. He can continue to be the face of the sport in his college. Still, he'll get his t-shirts for free. So there's that.